Sports Nutrition for Masters Athletes is the ninth in a series of health books written and narrated by Dr. Cory Holly. It is dedicated to men and women throughout the world 40 years of age and over, who love sport, exercise and physical conditioning. This book examines the specific nutritional requirements required by Masters Athletes and teaches a science based strategy that helps protect the body from oxidative damage, inflammation and various sports injuries. "Dr. Cory Holly has done it again, this is the secret remedy for reigniting your passion for physical and mental excellence! Sports Nutrition for Masters Athletes is packed with strategies that rebuild and help protect the body. 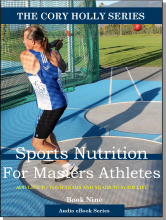 If you want to get serious about looking after yourself and making this your year of no regrets, then Sports Nutrition for Masters Athletes is for you."